Since starting The Finer Point I have found my most successful blog posts are about well used stationery. This is no surprise as I particularly enjoy reading about the tools people use on a regular basis. Seeing them beat up and well worn is all part of the charm, and understanding why they are so important to people is something that really interests me. With this in mind I have decided to incorporate a new feature on The Finer Point where every so often I will update you all with the tools I am using on a daily and weekly basis. Below is a brief description of everything included in my June Loadout. Nock Co DotDash pocket notebook. This is my brain dump notebook. I am using this for everything from weekly to dos, shopping lists, doodles and house/garden plans. I go through a pocket notebook around every 3 weeks and I would be lost without it. This is my first test run with the Nock Co DotDash pocket notebook and so far I like the different set up with the reporter notebook style. I won't ruin the fun with this too much, there will be a full review in the coming weeks. Mitsu-Bishi Hi-Uni - F grade. I have been using pencil in my pocket notebooks for some time. This allows me to enjoy a range of different pencils and I'm not frustrated with the paper quality. At the moment I am using the Mitsu-Bishi Hi-Uni F grade pencil a lot. Its a good quality pencil, the graphite is super smooth and I am a big fan of the harder graphite cores. Magic Koh-I-Noor eraser. This works hand in hand with the Mitsu-Bishi Hi-Uni pencil for any silly errors. This eraser is one of my favourites. Works well and leaves minimal mess. Uniball Signo 207. This is a new purchase for me and my first Uniball Signo 207 experience. I only bought this pen for an exam I had at the beginning of the month as sometimes a fountain pen can't be used in all situations. It writes well and is a handy pen to always have with me. I would prefer a finer line with this pen, but again it works well with pocket notebooks and is very inoffensive. Leuchtturm1917 Master Slim Grey. I have been using this notebook for tonnes of different things. It doesn't have a specfic task. So far I have used this for testing new fountain pens and inks, writing down some ideas for stories when they pop into my head, timed exam practice papers and assignment plans. The paper size of this notebook is great and I love it. Leuchtturm1917 paper takes fountain pens well and I really like the off white colour. A lengthy review of this notebook will feature on the blog soon. TWSBI RB 580 - EF nib. This is one of my most reliable, go to pens. It always performs and writes well and I have never had an issue with it. For me its a staple and a neccessity. I won't be without it. I currenty have this inked up with Pilot Iroshizuku Shin-Kai, although I have plans to swap this out with something different soon. Karas Kustoms Ink - F nib. This is my newest fountain pen which I am really enjoying using. The F Schmidt nib is a lot broader than my TWSBI nibs so gives me some variation. I also have this inked up with Iroshizuku Shin-Kai. Nock Co Lookout. I am always happily surprised about the quality of the Nock Co cases. I shouldn't be as there are glowing reviews from various different bloggers out there. 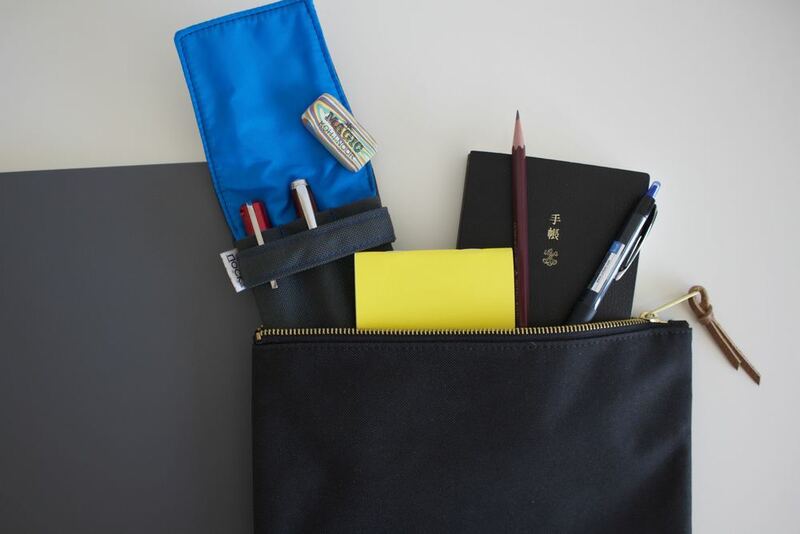 The Lookout is my favourite Nock Co case (I own several) and allows me to take my most in use foutain pens with me wherever I go. I have the Steel/Bluejay combination. The Bluejay interior is gorgeous and gives the case a lovely pop of colour. Hobonichi Techo Planner. I have written reviews on this product twice now, which you can find here and here. This is my journal where I record all the days boring glory. I am a huge fan of this planner, but as I have mentioned in a previous post I would enjoy this in a slightly bigger format. Herschel Supply Co Medium Pouch. This comes with me when I move around. I throw everything in this pouch to make sure I don't loose anything. It also means that its easy to find what I need as everything lives in one place. When I started planning for this post I realise how much stationery I use on a daily basis. These items are in regular if not daily use, and without each of them I feel like I could go a little bit crazy. I'd love to hear about any products you may be using regularly and how you use them.